A new report indicates that 18% of parents say that they plan to get tooth whitening for their teen as part of going back to school. The survey, by American Express, also apparently found that 9% of parents would be willing to pay for their kids' tattoos (yes, really!). When asked what services their dental practice offers, the dentists who responded with cosmetic dentistry were the clear majority in this survey. More aging baby boomers are turning to cosmetic dentistry to improve the appearance of their teeth, which may explain the increase in demand for cosmetic dentistry services. Dental implants are the most popular dental treatment among this demographic for the replacement of damaged or missing teeth. Here at The Wealthy Dentist, we were curious what services dentists are currently offering. The top services offered by dentists who responded to this survey are cosmetic, tooth whitening, dental implants, dentures, and children’s dentistry. Dentists were disappointed that other services were not included in this survey, like Botox, oral cancer screenings, or offering custom mouthguards for patient athletes. A general dentist responded that he now offers same day service for CEREC restorations as part of his dental practice services. 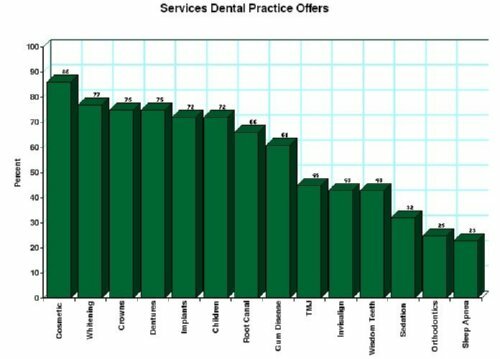 What dental services does your dental practice offer? Has the demand for cosmetic dentistry increased? Where is your dental marketing focused?